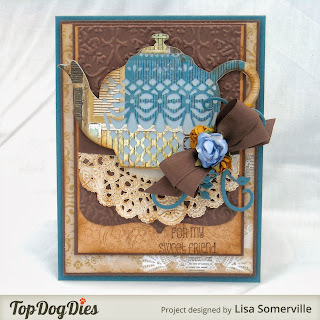 I'm not really a tea drinker, I'm more of a hot chocolate type of gal, but I love how delicate the Tea Time Decorative Die Set is from Top Dog Dies. To create my card, I stamped the flowers from Our Daily Bread Designs Be Joyful stamp set to create a background on the Caramel panel, then added the sentiment from this same set, stamping in Chocolate. The Espresso layer was die cut using Dies Pocket Album, and dry embossed. The larger tea pot from the Tea Time Decorative Die Set is die cut from Bo Bunny pattern paper, and adhered to the coordinating Tea Time Basic Die . I added a sponged doily under the tea pot, and embellished with some Vintage Brown Seam Binding, Zva Creative Mini Roses, and some swirls that were cut from card stock using Top Dog Dies Leafy Flourishes Die. Makes ya' wanna cuddle up and get cozy with a good book, doesn't it. Beautiful card and dc. Lisa, i adore all your cards and details.! hope to be lucky! Beautiful details on your work! and new ideas for cards, etc. Hope to be lucky!